We love to entertain at our home, but due to our busy schedules I am always trying to find something that doesn’t take long to make! These California Burger Bites are perfect for entertaining adults and kids. Cooked Perfect Meatballs make the recipe so simple as they are fully cooked and ready to pop in the microwave for a super delicious appetizer you will want to serve again and again. I have been a huge fan of Cooked Perfect ever since I tried their meatballs when I made this zoodle recipe. The meat is perfectly seasoned and made from the finest meats, you will not be disappointed in the flavor or the texture. Best part is you can make them in the microwave! They take approximately one minute per three meatballs, so to make this entire bag of twenty it took only six and a half minutes! I wanted to add a little something extra for those wanting a special something to add with onions and Applewood bacon. I served this to my kids and to teenagers/adults, the younger kids preferred the bites without the onion jam, so this will appeal to all groups! I absolutely love the taste of this bite! The crispness of the bacon, the cool flavors from the guacamole and cheese married perfectly with the Cooked Perfect meatball. I did choose to serve these hamburger bites with kale because I thought it looked so cute, but you could easily replace the lettuce or cheese with the toppings you prefer. Cooked Perfect meatballs are the best prepared meatballs I have ever had! You can buy them both in the refrigerated section and the freezer section. This Angus beef variety will be found in the freezer section. Find Cooked Perfect Meatballs at a grocery store near you – I found mine at out local Target. 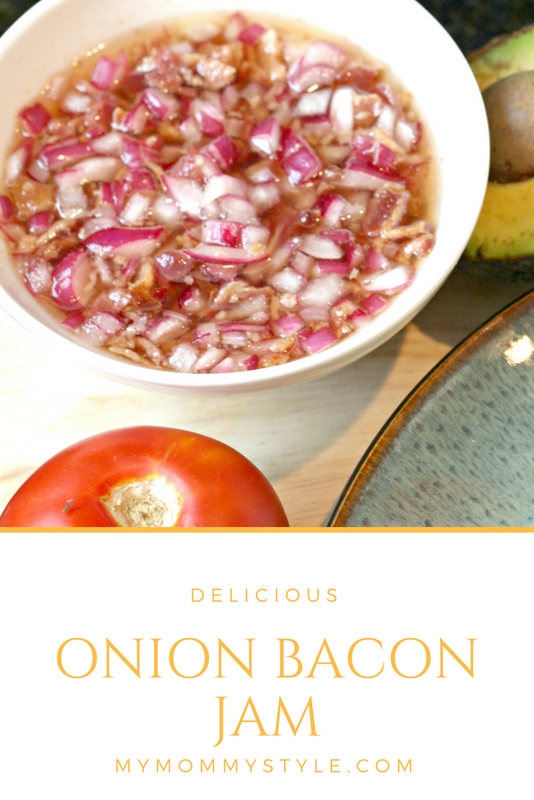 If you want to add a little something special for your guests with a more mature palette, pair this recipe with the onion bacon glaze recipe below! Onion Bacon Jam will delight your tastebuds and make your meat even jucier with the perfect blend of salty and sweet. Combine. Enjoy! This can be eaten on top of any meat to add a special zing! I hope you enjoy this appetizer, I know I will be making it again! BBQ’s, sporting get togethers, and holidays! Browse more meatball recipes for some inspiration of what to make next!